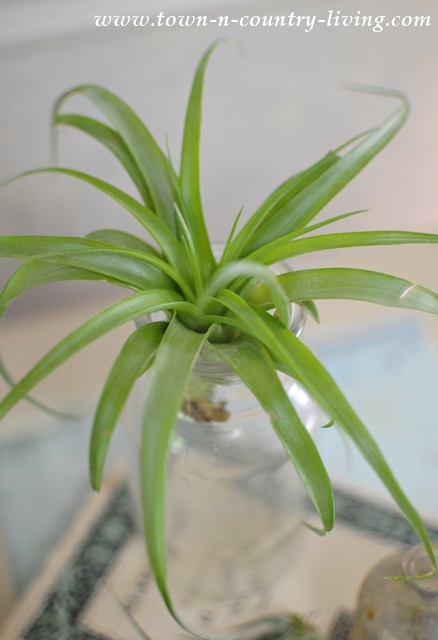 Are you looking for an easy-to-grow plant because your thumb is … well … not so green? Look no further! 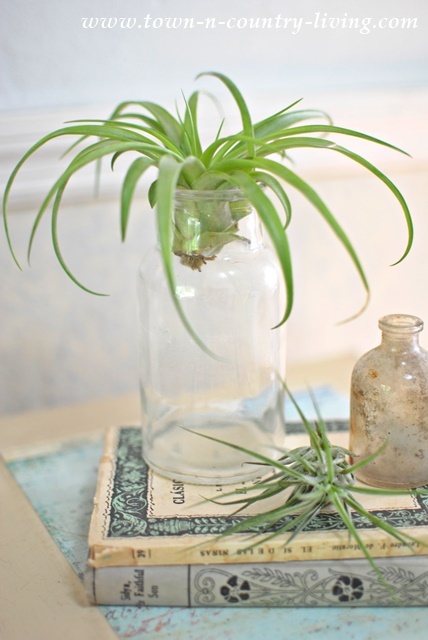 Air plants are the easiest green thing to grow and require very little care. 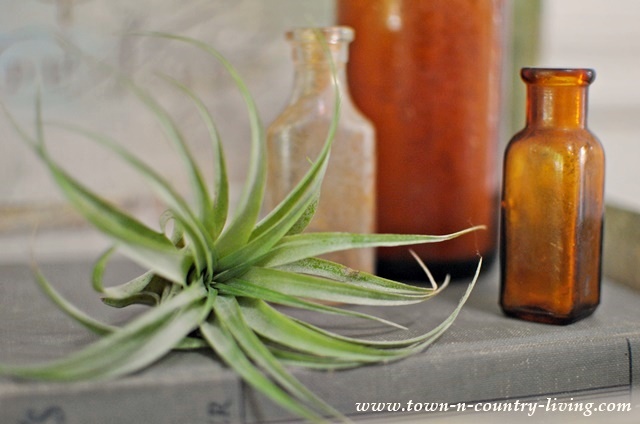 Also known as Tillandsia, they do not thrive on air alone. You’ll need to water them from time to time. I love these plants. They’re graceful and exotic and look pretty anywhere you place them. Some are soft and green like this one. Others are silver or multi-colored. 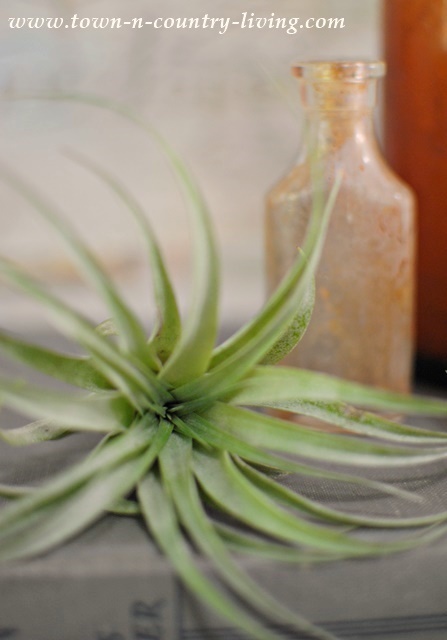 You’ll find air plants in a variety of sizes, too. I found my latest group of air plants at the flea market. This tiny Tillandsia was just $2, but most are a little more expensive. 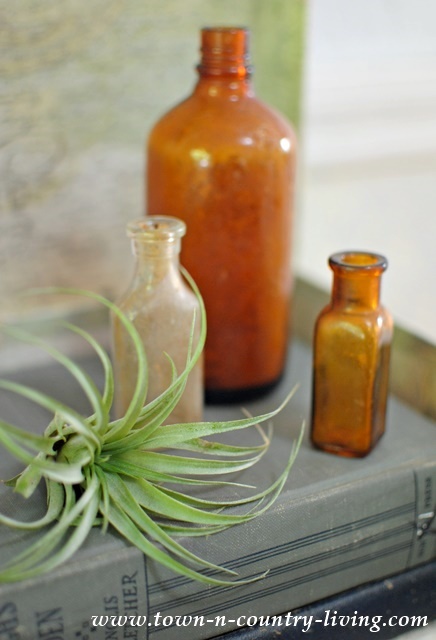 Air plants enjoy bright, indirect sunlight and good air circulation. If the tips of the plant should ever become brown, simply snip it off with scissors. Angle the cut to make it look more natural. 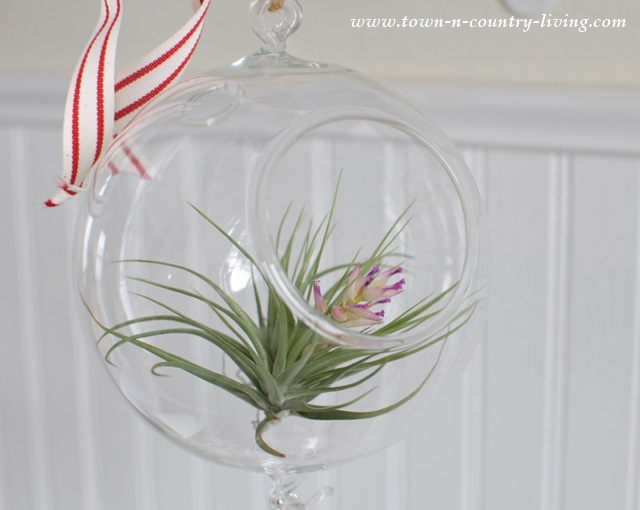 Be sure to water your air plants 2 to 3 times per week. I simply set mine in a bowl of water for about 20 minutes. Then I remove them, shake off the excess water and set them on a windowsill to dry out. 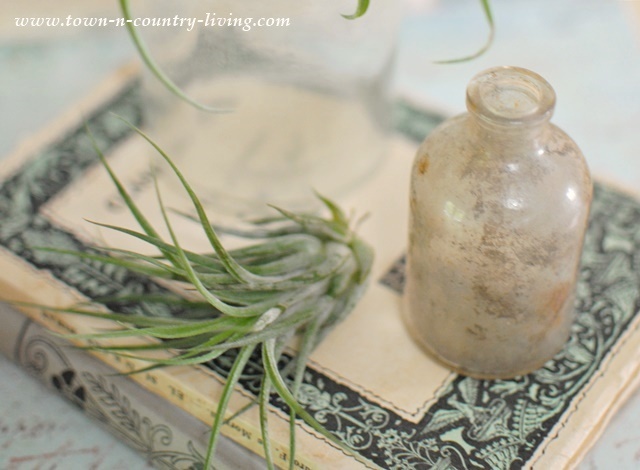 There’s one thing about air plants that I find very sad. They only bloom once in their lifetime. Their flowers are dainty and pretty, and luckily last for quite a long time. I was fortunate to find this one at the Mossy Twig just as it started blooming. You can set them almost anywhere, provided they receive indirect, bright light. Such pretty little things that thrive with minimal care … even if you do have a brown thumb! Jennifer, I really enjoyed your post today! 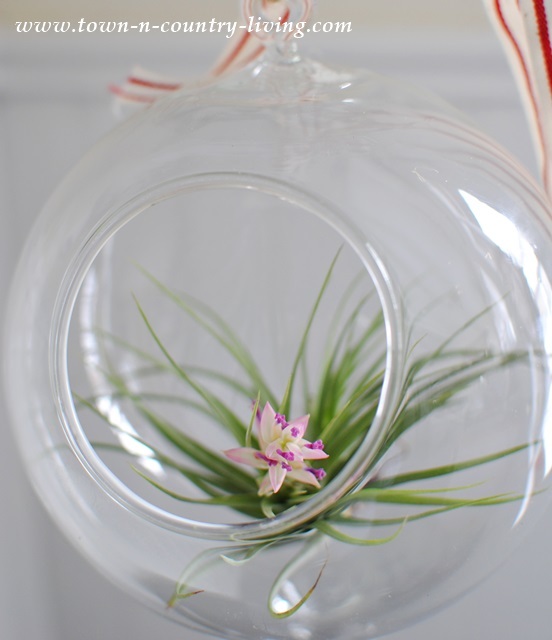 I haven’t thought about air plants for a long time, but this puts me to thinking perhaps I should get one or two. Yours really are pretty and how fortunate you are to have one that is in bloom! I had one that was called, as I recall, an “air fern” many years ago. I think I was told when I bought it that it did not require water at all. Maybe that is why it didn’t last as long as it might have because I didn’t water it, not at all! Have a beautiful and blessed weekend! for future use when I move into my new home. I just discovered that I could “Pin”. Thanks anyway. Great post, I love how easy they are to take care of! Of course being able to put them just about anywhere is makes them so cool! I didn’t have much luck finding air plants locally so I searched online and found a bunch at Air Plant Design Studio, and I got a free air plant with purchase!